bike lanes | Park View, D.C. The pop-up bike land on Kenyon, 9/21/18. As part of Parking Day on Friday, September 21st this year, DDOT constructed a temporary pop-up bike lane on the 400 block of Kenyon Street, NW. This was an extremely valuable experience as DDOT is looking at ways to incorporate a permanent protected bi-directional bike lane on Irving Street between Michigan Avenue, NE, and Warder Street, NW. 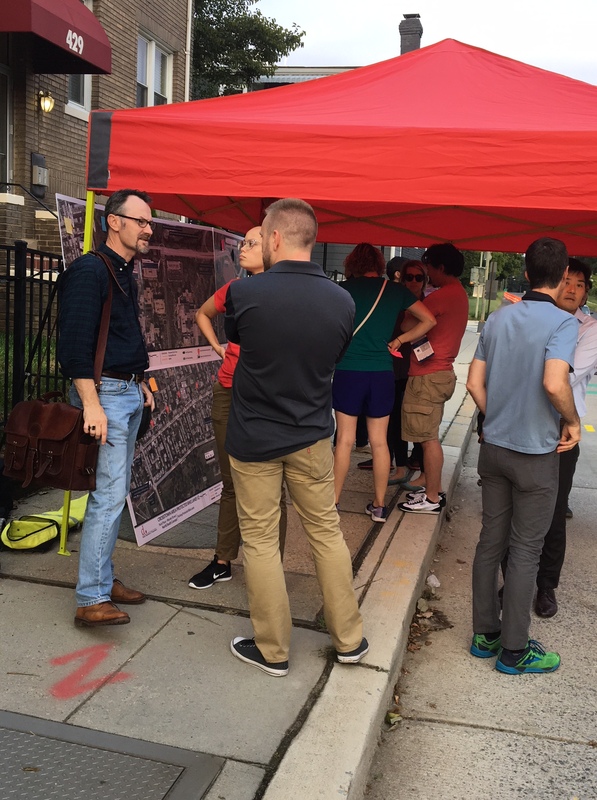 The temporary bike lane on Kenyon offered a good opportunity for DDOT to get feedback from residents as well as watch how traffic adjusted to accommodate the lanes. Overall, I believe the bike lane pop-up was a success due to the information learned to help inform the next steps. As expected, comments related to DDOT’s plans are mixed, with some strongly in favor and others opposed. In addition to making Kenyon one lane during rush hour, some are concerned that a protected bike lane will reduce on-street parking. All of this would still need to be worked out. Although, based on the boards that were shared with the community, it does appear that there is room for protected bike lanes, bump outs for new trees on Warder Street, and new parking along Park Place IF the suggestions proposed by DDOT meet with approval. Its difficult because every opportunity is accompanied by a trade off. 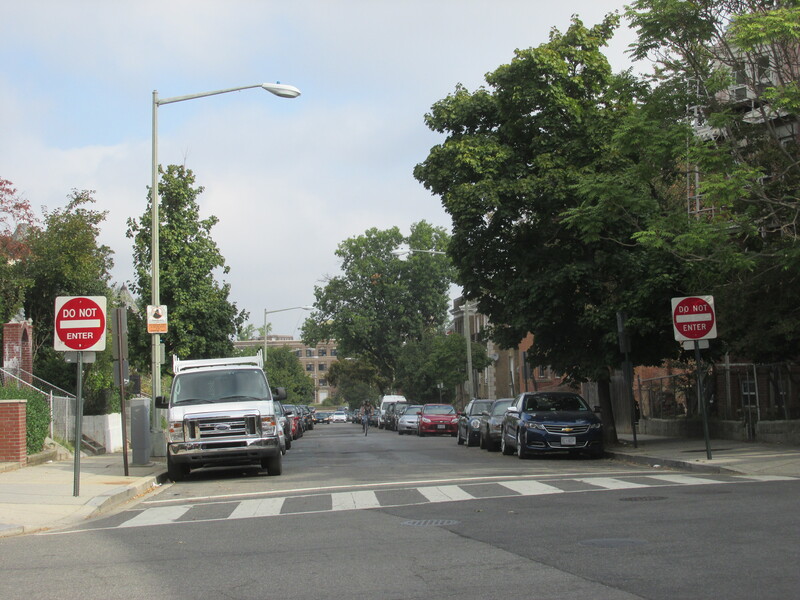 I was really exited to see that DDOT has been paying attention to much of what I’ve been suggesting over the years, especially with regards to incorporating bump outs on Warder Street to create new locations for street trees. See plan below. In DDOT’s proposal, they suggest 11 areas where bump outs could be created. But, this would remove 20 on-street parking spaces. As it is, the bike lanes may also reduce on-street parking spaces. This is a difficult trade off considering that demands on parking are increasing rather than decreasing. I’ve already met with the members of the project team at DDOT’s offices to review the plans and will be going over them block-by-block to see if there are missed opportunities or better locations for bump outs, and hope to get an initial survey completed before the end of October. In order to counter balance the impact on parking along Warder and Kenyon, DDOT is looking at the possibility of placing parking on both sides of Park Place, NW. The benefits of placing parking on both sides of Park Place would be that cars in addition to bollards would help protect the bike lane along the Soldiers’ Home. Additionally, it would reduce Park Place to a single travel lane, greatly reducing the speed of traffic along the street which has long been a problem. It would also increase neighborhood parking by more than the spaces lost elsewhere due to other aspects of the project. 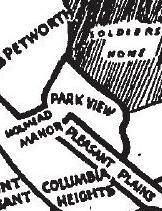 The biggest negative would be that it would limit the vista of the Soldiers’ Home along Park Place. While there is much to consider, DDOT is still working to get to a 30% plan by the end of the year, and presuming the development of a winning plan, implementation by the end of 2019 at the earliest. 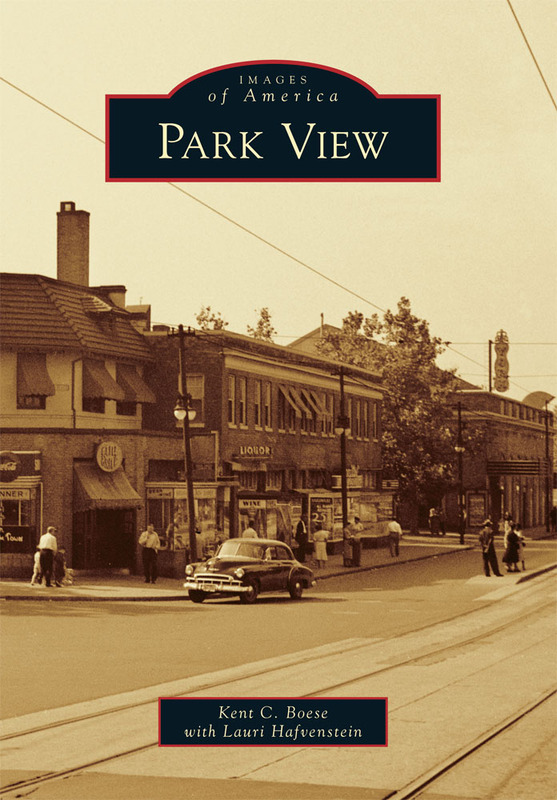 To help the community get more information and provide more feedback, I’ve invited DDOT to be the guest at the November meeting of the Park View UNC. That will give them time to incorporate the feedback they receive during their pop-up trial last Friday. 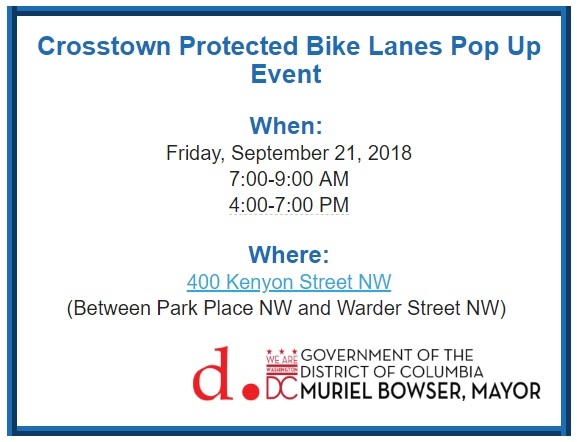 As part of DDOT’s efforts to establish protected bike lanes in Park View, they have scheduled a Bike Lane Pop Up Event for the 400 block of Kenyon Street on Friday, September 21st. Below are the details and this is definitely worth checking out. On Friday, September 21st, 2018 from 7-9 AM and 4-7PM, the project team will be available to speak to the public about a full-scale model of the protected bike lane along the 400 block of Kenyon Street NW located between Park Place NW and Warder Street NW. 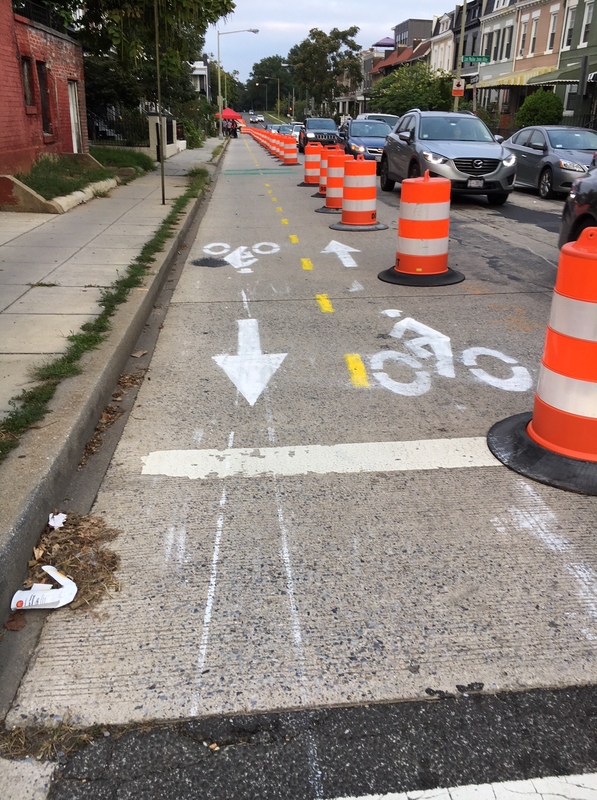 The temporary bike lane will be along Kenyon Street NW from September 19 -September 22, 2018 as part of the Crosstown Protected Bike Lanes Project. The goal of the temporary installation is to demonstrate how the proposed bike lanes will function and to provide the public with an opportunity to speak with the project team about the Crosstown Protected Bicycle Lane Project. www.dccycletrack.com/crosstown for more information on the project. 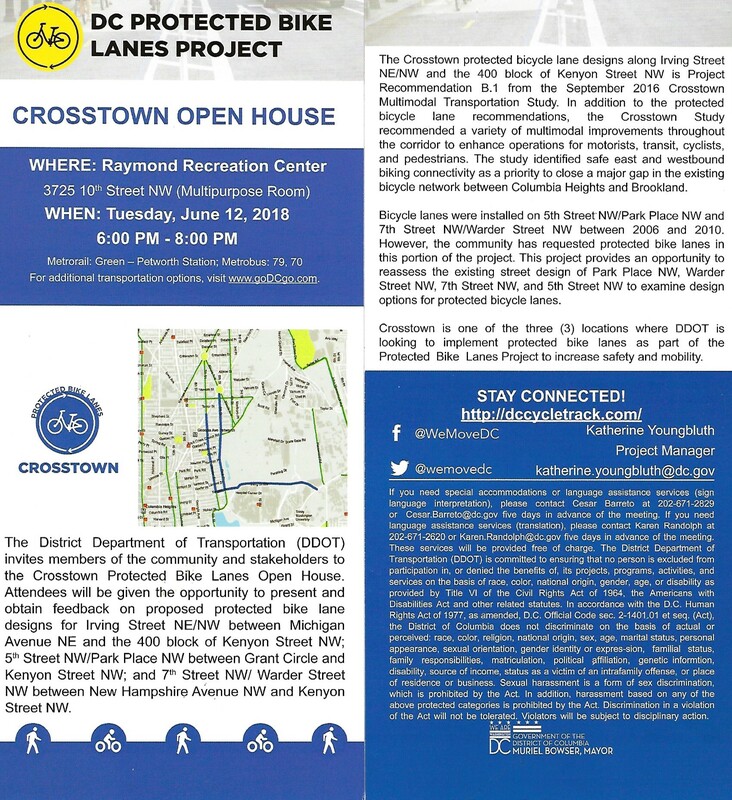 The Crosstown protected bicycle lane designs along Irving Street NE/NW and the 400 block of Kenyon Street NW is Project Recommendation B.1 from the September 2016 Crosstown Multimodal Transportation Study. 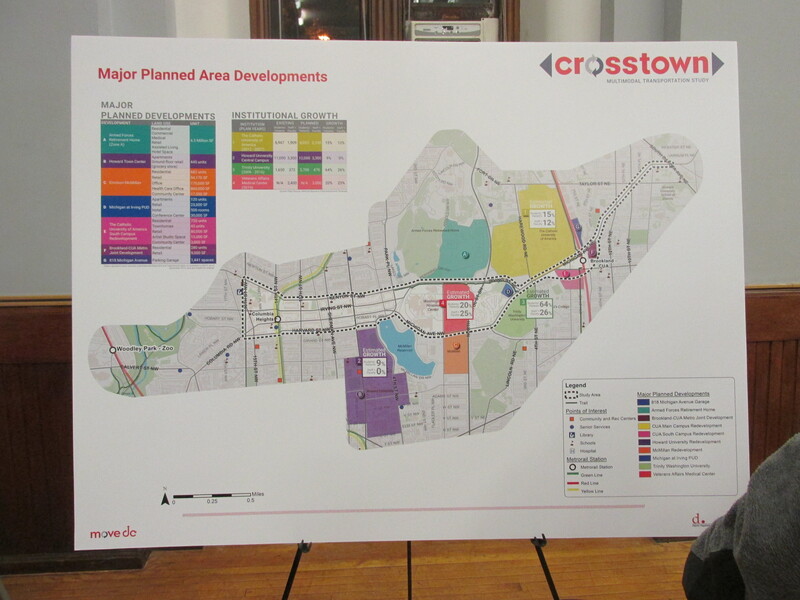 In addition to the protected bicycle lane recommendations, the Crosstown Study recommended a variety of multimodal improvements throughout the corridor to enhance operations for motorists, transit, cyclists, and pedestrians. 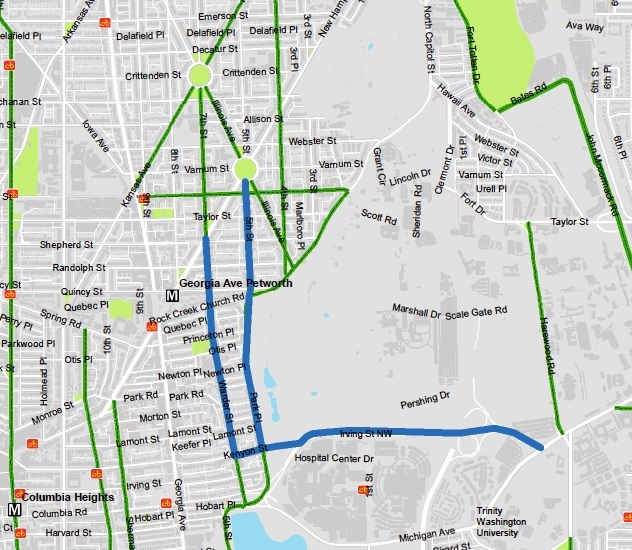 The study identified safe east and westbound biking connectivity as a priority to close a major gap in the existing bicycle network between Columbia Heights and Brookland. Bicycle lanes were installed on 5th Street NW/Park Place NW and 7th Street NW/Warder Street NW between 2006 and 2010. However, the community has requested protected bike lanes in this portion of the project. 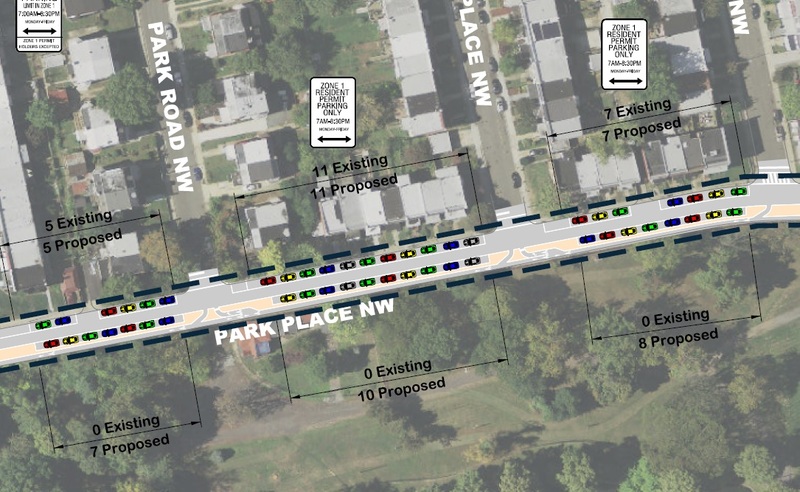 This project provides an opportunity to reassess the existing street design of Park Place NW, Warder Street NW, 7th Street NW, and 5th Street NW to examine design options for protected bicycle lanes. 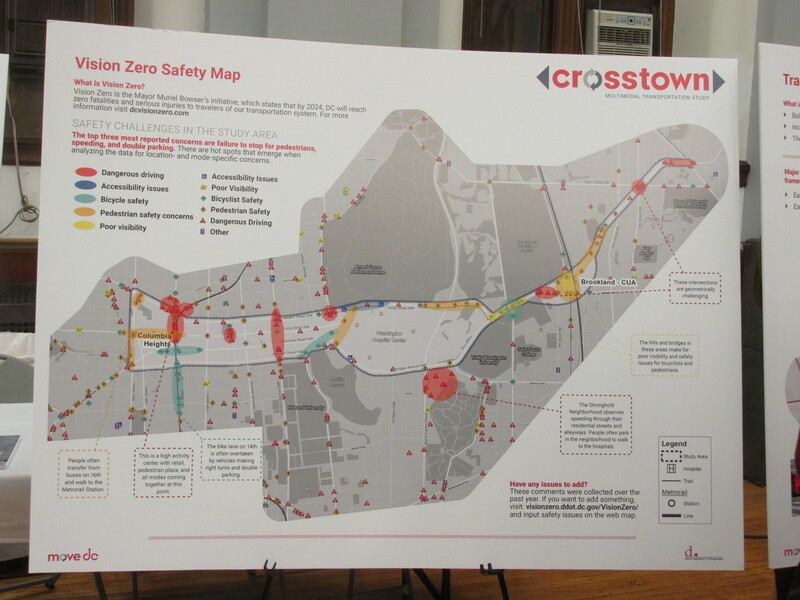 Crosstown is one of the three (3) locations DDOT is looking to implement protected bike lanes as part of the Protected Bike Lanes Project to increase safety and mobility. Over the past week, DDOT has done a great job of distributing door hangers in the Park View neighborhood to alert residents of a meeting on June 12th that will look at a proposal for protected bike lanes on Warder St. and Park Place. I’m very excited about this as I’ve advocated for a review and reworking of the bike lanes, and other street improvements, through ANC1A on these streets already (see resolutions from July 2015, April 2016, and January 2018). While the focus of the meeting will be protected bike lanes, I see a tremendous opportunity here to address a variety of streetscape issues that impact walkability and traffic congestion as well. 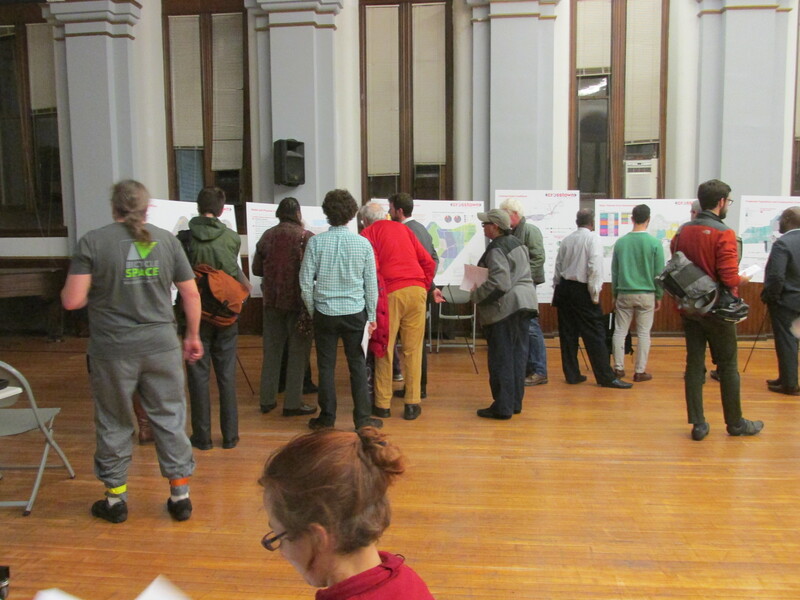 (Residents examining the data boards at the February 2 Crosstown Multimodal Transportation Study). 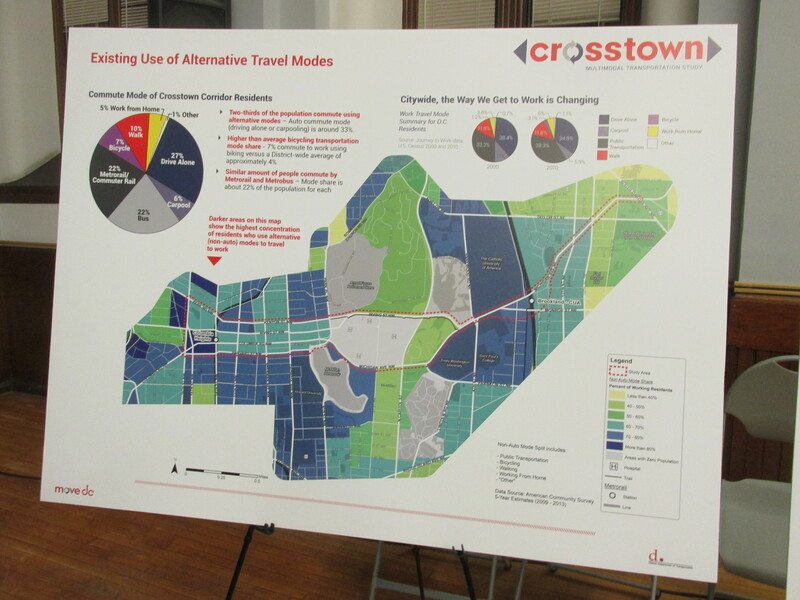 DDOT kicked off its first in a series of meetings devoted to their Crosstown Multimodal Transportation Study at Trinity Washington University last night. The format was a series of informational work stations where residents could ask questions, provide feedback, and share ideas. 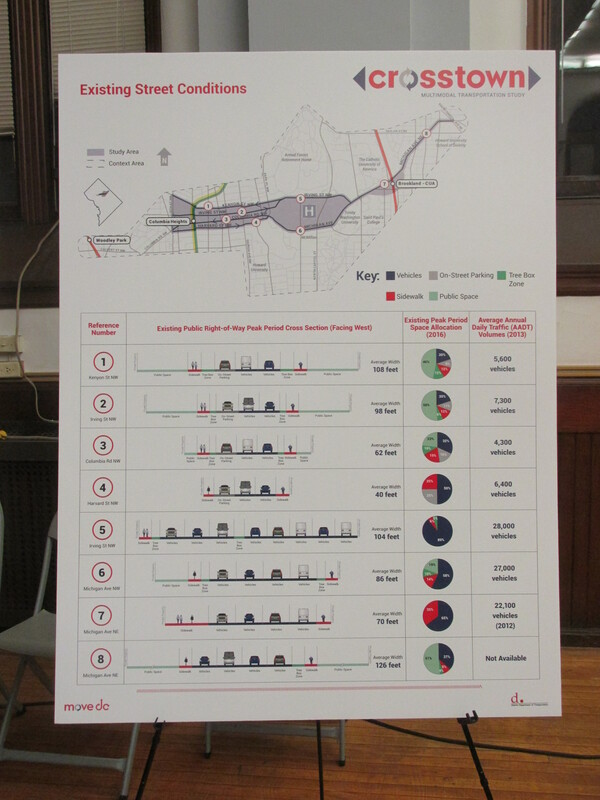 Some of the stations shared data gathered from previous DDOT efforts whereas others were interactive. The goal of the workshops is to improve all modes of east-west transportation between South Dakota Avenue and 16th Street. Each of the workshops will build on information learned from the earlier workshops, so there is value in attending all of the meetings if this issue is important to you. There were three stations that I particularly liked. 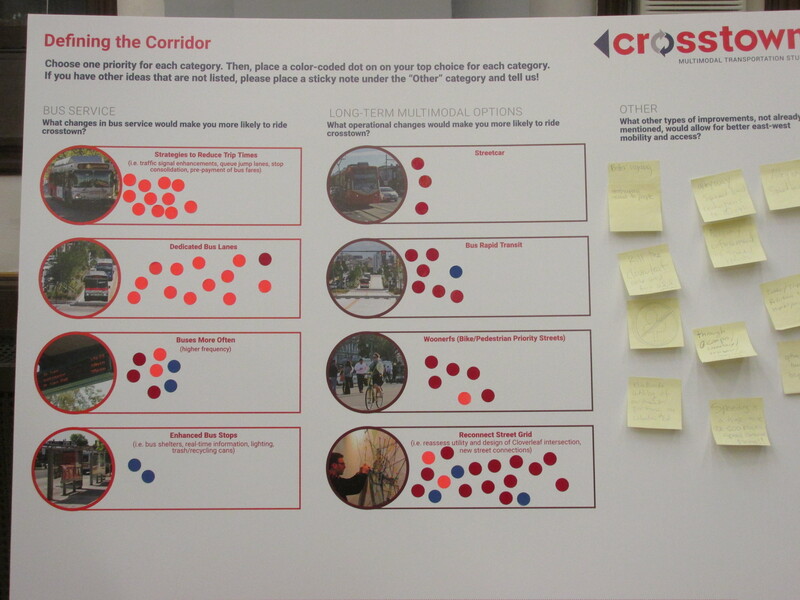 One was an interactive map where residents could add comments and note issues throughout the study corridor (see below). The map is accessible here and I encourage people to add their comments. Another one had a number of categories and participants were asked to put colored dots to show what they valued most on the list. Below are photos of the categories also showing where people placed dots. 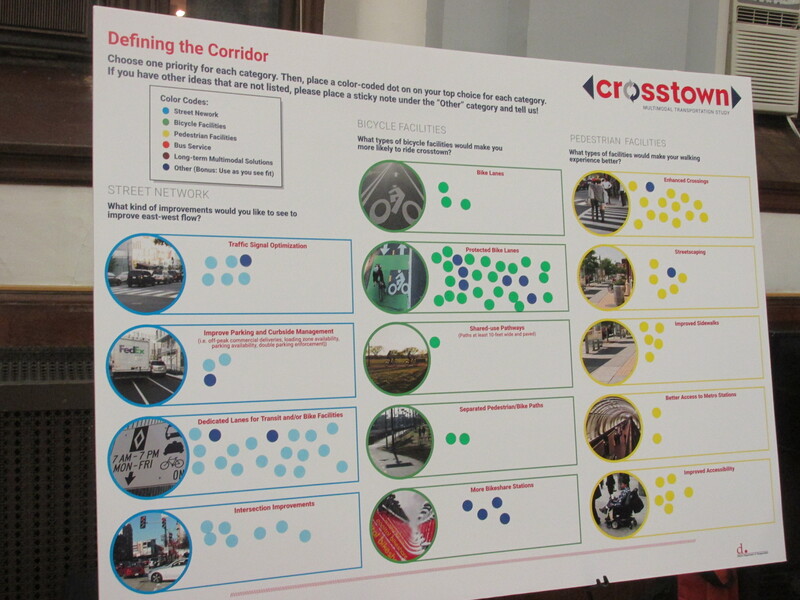 The categories with the most support were dedicated lanes for transit, protected bike lanes, enhanced crossings, dedicated bus lanes and strategies to reduce trip times, and reconnecting the grid. Yarn colors representing transportation in the east-west corridor. In addition to the interactive stations, there were information boards. Below are a few photographs of them. According to a Notice of Intent I’ve received (click on image below for full notice), DDOT is proposing a contra-flow bike lane on 11th Street, NW between Monroe Street and Spring Road. This block is currently a one-way southbound road for cars. The new bike lane would be two-way for bikes while remaining one-way for cars. Cyclists traveling north would use the new bike lane, while southbound bike traffic would share the travel lane with cars. 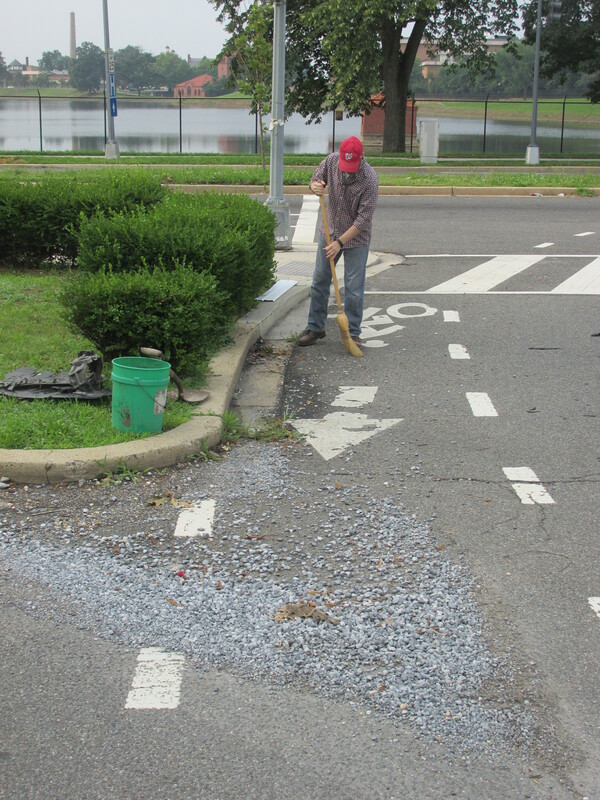 Beginning to clean up the gravel in the Warder Street bike lane. On June 1st I was alerted to loose gravel in the bike lane at the south end of Warder Street, NW. I presumed this would be an easy issue to resolve and reported it to 311. As it turns out, this was not an easy issue to resolve. After reporting the issue to 311 and then escalating the issue with the Mayor’s Ward 1 representatives in the Office of Community Relations and Services (MOCRS), a month later the loose gravel was still there. As I’ve dug into this problem, it is my understanding that keeping bike lanes clean of minor but often dangerous debris is a citywide issue. Not being one to let a problem with a simple solution linger, I took it upon myself to clean up the gravel myself. While Warder Street is now clean, there are other bike lanes elsewhere that still need attention. With this in mind, I will continue to work with the city to find a lasting citywide solution to this problem. In short, I believe that if Washington is going to invest in bike infrastructure, we also need to invest in bike lane safety and maintenance to ensure that these resources are in good repair and safe.